David Sheumack 04/08. Photo Ken Woods. Peter Tristram 06/12. Derek Butcher 05/16. Peter Tristram...."This extensa was collected in 2003 on the other side of the range to where T. mima v chiletensis grows, in a gorge as you head into the Andes inland from Chiclayo, near Chongoyape - so it has provenance! It is actually mounted, though I usually pot these terrestrial types." Derek Butcher...."Only 23 years to flower in Adelaide. We did have a dry summer which is probably why the shortened branches." The following photos were part of a discussion about a T. extensa that turned out to be T. mima v chiletensis. 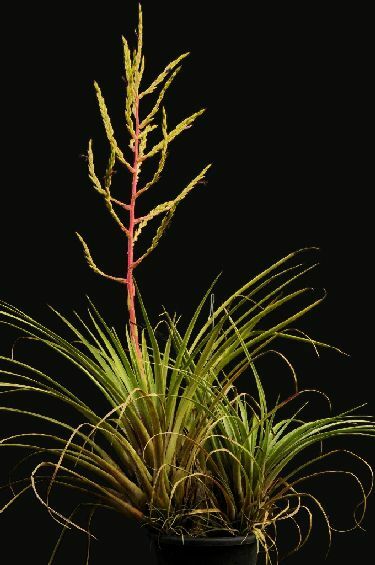 There is nothing in the write up that this species is viviparous. Comments? Bruce Dunstan, 26/04/13 4:53pm.... Derek, do you know where you sourced your plant from ? I have a very silvery plant from Peter who got it from Knize that is in spike at the moment, but no ideas on viviparous pups. Derek Butcher.... Bruce. Surprise surprise. Mine came from Knize about 30 years ago as hitchcockiana. It seems a smaller more silvery extensa than what you lot grow in the east. Perhaps I should get used to pseudoviviparous. Ray, 26/04/2013 4:05pm.... Derek, not knowing what viviparous meant, I used the wonder of the iMac to inform myself as copied and pasted below, does this mean that the buds formed whilst flowering or on the old flower spike after flowering? As for T extensa, I have no prior knowledge of it's habits. In plants, it means "reproduction via embryos, such as buds, that develop from the outset without interruption, as opposed to germinating externally from a seed." Derek Butcher, 26/04/2013 4:13pm.... Newbies please note. Bromeliaceae terms have been influenced by Americans (Viz Lyman Smith) which is why I concocted a Glossary so I can swot up from time to time. This is why I have a Glossary on the Tillnuts DVD. You can ponder whether I was correct in using viviparous and not pseudoviviparous! In my thirst for such valuable knowledge I am now trying to trace what phyllanthidea means. Mez used this word in 1896 and nobody so far including David Benzing (who loves to use long words) has been much help. It was used as a genus name in Euphorbiaceae in 1857 and Euphorbia have some odd flowers. I haven't given up yet. Bob Hudson, 26/4/13 6:27pm.... 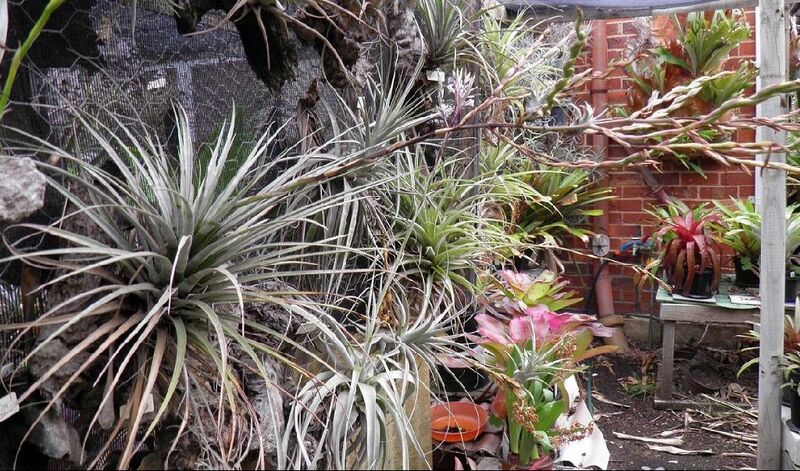 Here is a photo of Tillandsia extensa I got from Grace Good many years ago. 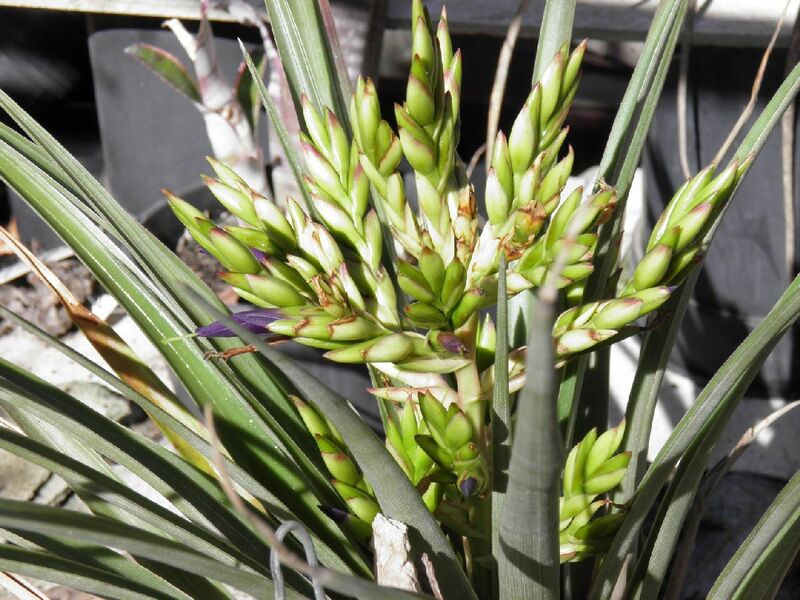 Andrew Flower, 27/04/13 5:28pm.... My T. extensa has no offsets on the infloresence UD, but it does flower in successive years on the same inflorescence - see pic. This plant was grown from seed I received in 1975/76 with a Rauh collection number on it. Unfortunately the number got lost over the years. It flowered for the first time in 2011 (do the math!) 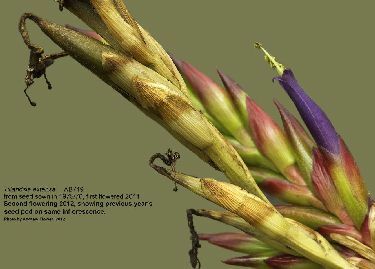 and again on the same inflorescence in 2012. It is self fertile but (again doing the math) I decided not to bother sowing seed of it this time. It also pups profusely. Derek Butsher, 28/04/13 7:47pm.... Andrew, I thought that only Deuterocohnia were supposed to do that. Will add your photo to the Tillnuts DVD if only to prove that nature knows no rules! Peter Tristram, 29/04/13 12:30pm.... 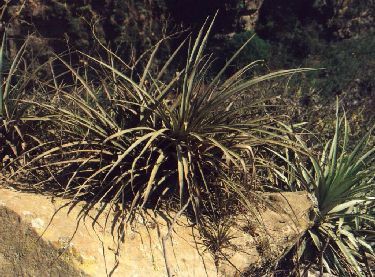 Photos of T. extensa from home and habitat shots (Chongoyape Peru). 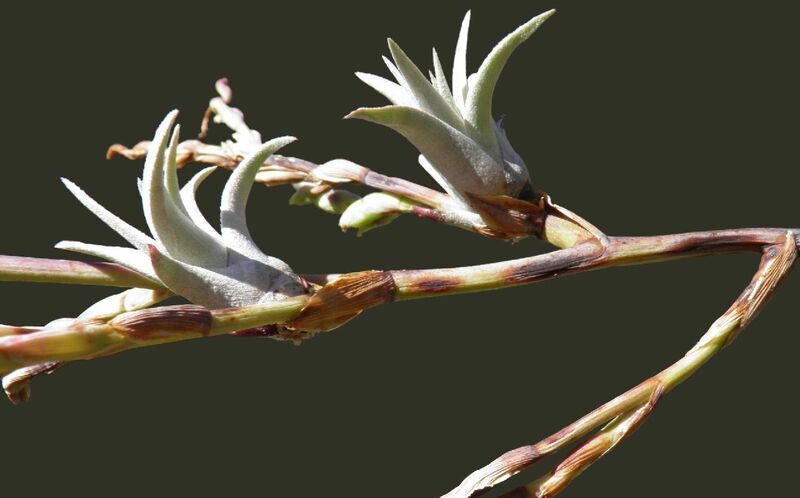 For me extensa frequently blooms for a second year, usually after appearing to stop, seed pods set as well, either on new branches or extensions of the original ones, but I can't remember a third or more season of blooming. I have never had viviparous whatever pups on them either and I would like to see a photo of the whole of Derek's plant in case it's a mima v. chiletensis or some other similar species. It doesn't look like propagulifera though. I'd also love to see the plant Bruce is blooming (hint) as we might be able to figure out what it is. All of my forms (Knize, Heidelberg, BRT, Tropiflora, self-collected and probably a few more sources) give adventitious pups. 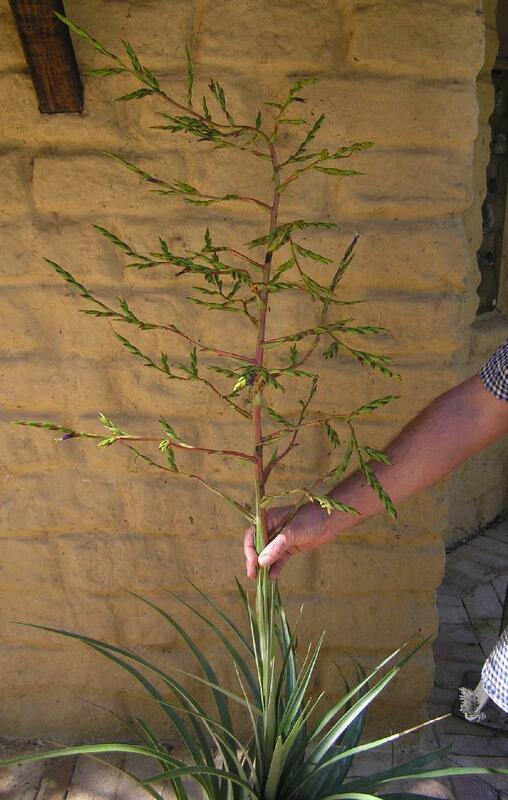 Attached are few pics of it in habitat and a plant from that site blooming at sunny Repton. 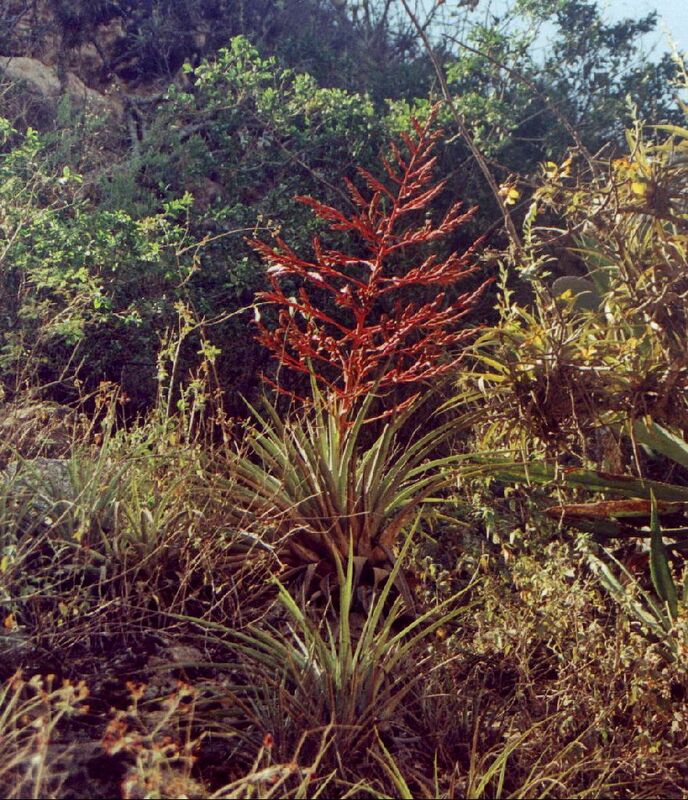 This extensa was collected in 2003 on the other side of the range to where T. mima v chiletensis grows, in a gorge as you head into the Andes inland from Chiclayo, near Chongoyape - so it has provenance! It is actually mounted, though I usually pot these terrestrial types, as I decided to stunt it. 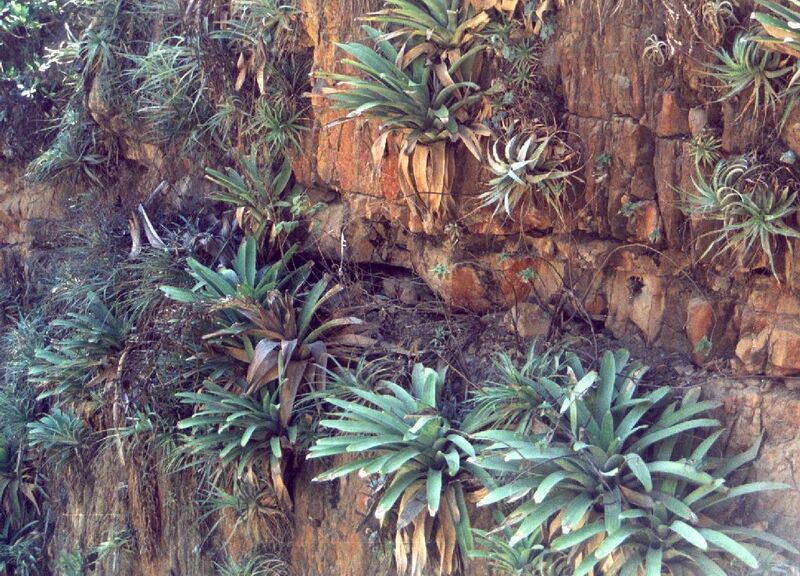 The cliff pic features species like T. teres, extensa, hitchcockiana/cereicola, R. multiflora and some spiny stuff. Peter, you have it in one. I am now fairly certain I do have T. mima v. chiletensis. 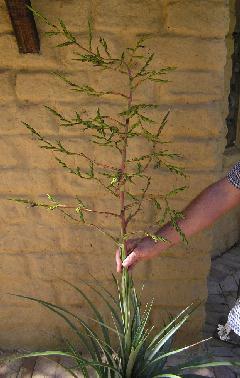 Photo of plant attached. When taking the photo I noticed that flowers were distichous leading to T. extensa but on branches now becoming herbarium material they were clearly secund pointing to T. mima! All of this needs recording for future queries! Peter Tristram, 1/05/2013 06:34pm.... Derek, the viviparous bit got me thinking so I checked your inflorescence against a T. mima v. chiletensis in my greenhouse and decided it just had to be. This is a very slow species for me and I really need a drier spot for them. I saw huge ones in Germany too where they must take a lifetime to bloom. Derek Butcher..... You think yours are slow. Mine took over 30 years! 5 years back Adam Bodzioch used Ethrel and got a one branched spike and a single flower which I identfied correctly. 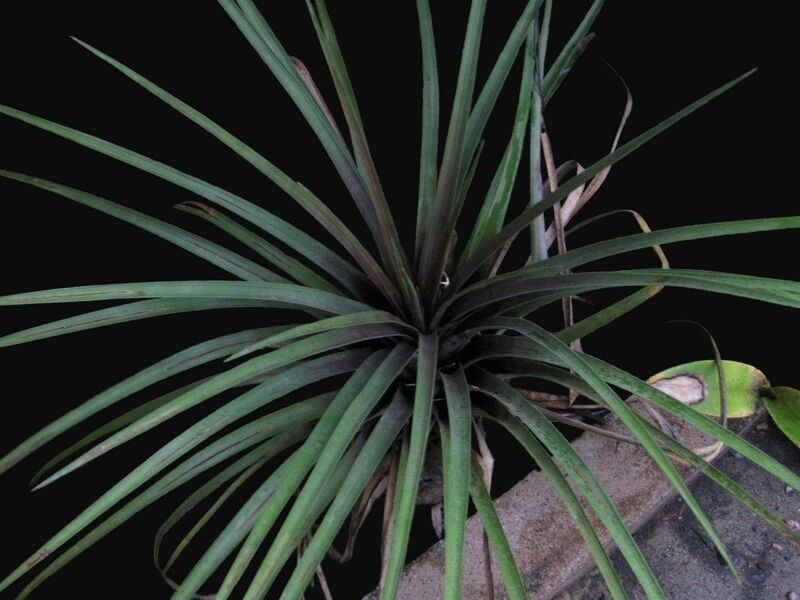 My plant took a further 5 years to do its thing naturally and got wrongly identified as T. extensa. !